It was back to the barricades for my third time this month as I took in Wright State University’s LES MISERABLES today. There were some very good things about this production, which stayed true to traditional expectations. I enjoyed the singing by the entire cast and I thought the staging – especially the use of the turntable – was very well done. Standout performances from Liz Romey (“Eponine”) and Zack Steele (“Marius”) helped keep my attention. Steele was as good as I’ve ever seen him – and I’ve seen him a lot. He made me feel every word of “Empty Chairs at Empty Tables.” The entire cast was very good and several others were great including Mark Beyer, Keaton Eckhoff, Ian Benjamin, Kaitlyn Sage, and Connor Lysholm. I especially enjoyed the work of Law Dunford as “Inspector Javert.” His ability to emote through music shows a maturity that is rare in college productions. Kudos to him as this is perhaps the most difficult character to bring to life and make him seem more than a one-dimensional plot device. I’m not sure what else I can say about the work of Andrew Quiett. 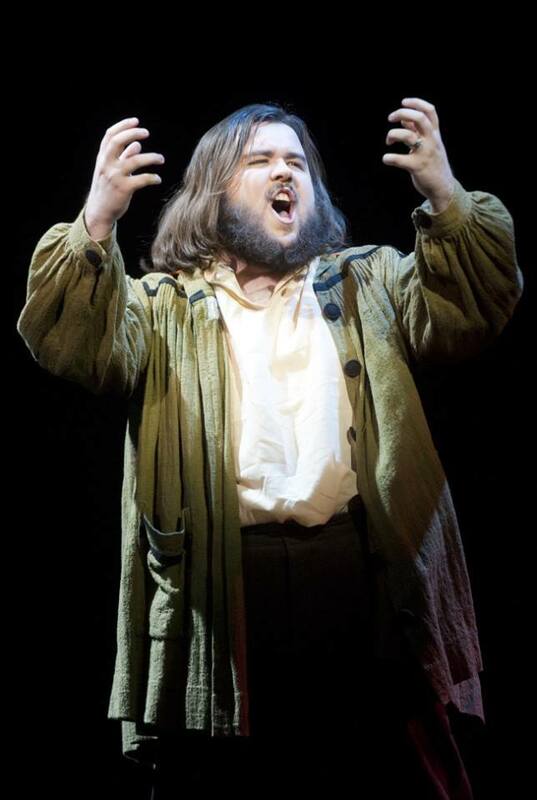 He has dazzled me time and time again but as my friend said about his turn as Jean Valjean, “This is the role he was born to play.” His voice, his facial expressions, his body language, and his amazing presence all came together for the performance of a lifetime . . . and he’s in his early 20s. How good is this guy gonna be when he’s 30? Keep an eye on him. I do have some criticisms. Generally speaking, this show’s pacing drug on and on especially in the beginning of Act Two. I appreciate the need to allow the characters and emotional moments to breathe in order to feel the full effect but even still I wasn’t moved. I’m not sure I would have been had the show quickened at all, but I know I wouldn’t have found myself looking around the theatre at the lights and other patrons. Secondly, I appreciate Wright State giving me so much show for my money but can we please try to produce a quick paced, one-act 90 minute show soon? DEATH OF A SALESMAN, OKLAHOMA, THE MAGIC FIRE, and LES MISERABLES . . . these long shows are hard to sit through especially given the attention spans of audience members in 2014. . . Which leads me to my next thought. I have to say this because it really did make it difficult to enjoy the show for me today. If you are performing and you have family coming then kindly make sure they understand and demonstrate basic theatre etiquette. No food in the theatre, especially food in wrappers that make noise, means no food. There’s never a need for ongoing conversation during a performance, but its especially rude to the other actors once your character has been killed off. It’s as if they are saying, “I just came to see him/her and the rest of them don’t matter.” Also, there’s really no need to say “that’s my niece/nephew/kid/grandkid/friend” during the show. You wanna brag, do it before the lights come up or at intermission or even during curtain call. That’s great. Be proud. I too am proud of these students who I’ve followed and supported and done many favors for over the years. But be respectful of others. That’s all, I’m asking. 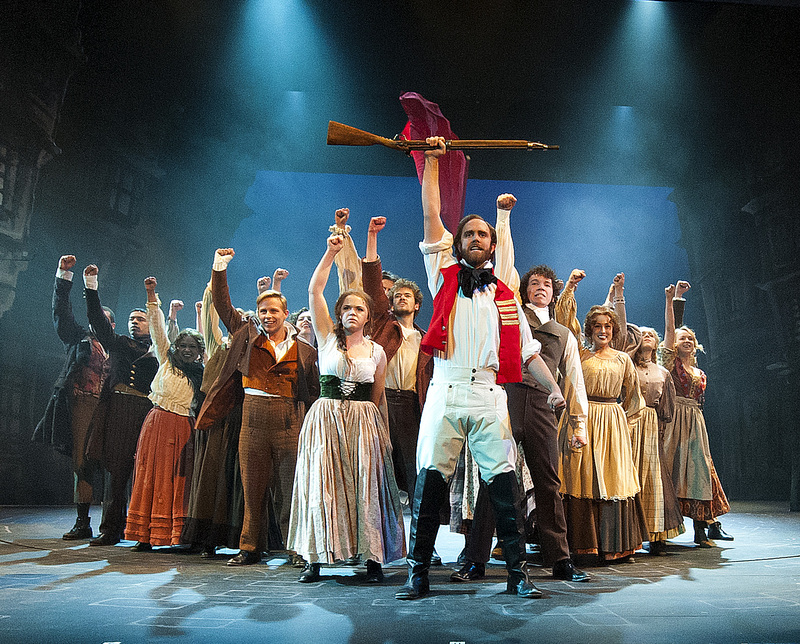 LES MISERABLES will go down as a wild success, as it rightfully should. It’s a stunning musical and Wright State continues to produce epic shows like this each year, getting bigger and better with the sets, costumes, and technical details each time. I’m especially excited about PETER PAN featuring Bruce Cromer as “Captain Hook” next season. I am just hopeful that it won’t last 3 hours. 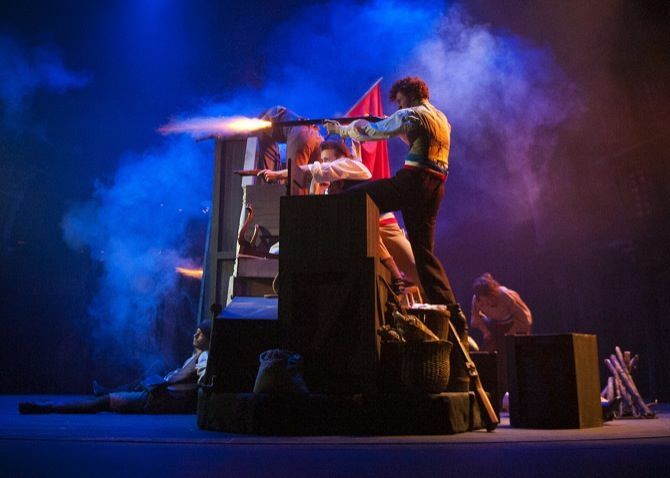 LES MISERABLES ends its sold out run on April 6th. Next up is THE CHERRY ORCHARD opening this Thursday, April 3rd. Click here for more information.